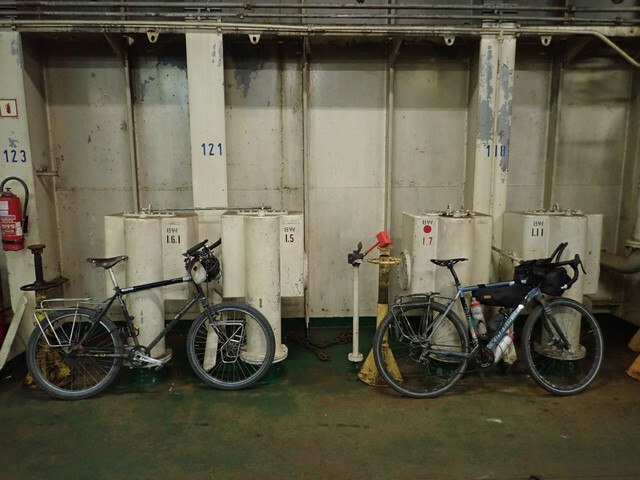 Post a photo of your bike and a ferry. Re: Post a photo of your bike and a ferry. with the Brooks and the Warmshowers stickers - somewhere we have another cyclist on board and he's almost certainly British. What's more, the two of you appear to have identical taste in rear racks (bar colour)! Enjoy Ukraine. "He" could be a "she"! He could be a she, but I'm guessing not based on the geometry of the bike. I've been keeping an eye out for any telltale tan lines or bike brands among the truckers at lunch aboard, but haven't seen any. I certainly haven't seen any 6' when though, so am working on the assumption that he is a he. Whoever s/he is, his/her taste in rear racks is indeed impeccable. Intriguing! I'm hoping there's a element of romance in this situation, the story could make an excellent blockbuster, "Sleepless on the Black Sea"! Who would you like to play you? Don't look up look down: Check the shoes. It turns out he is indeed a he and is indeed 6', but he's French and he bought the bike in Thailand. I'll award myself a C on the Sherlock scale.